I've spent the last couple of weeks in rural France but at the same time I've been immersing myself in the Himalayas to write a song about the elusive and beautiful snow leopard. I read Peter Matthieson's 1978 travelogue The Snow Leopard; ultimately an unsuccessful search for the cat itself but a highly evocative piece of writing describing his inner meditations and outer journey trekking through the Himalayas - a wonderful piece of scene setting (and made me feel more sympathetic towards my old teacher of Himalayan architecture at Uni whose lectures were utterly dry but I guess he must have had similar adventures to Matthiesen so standing in a campus classroom would have been in dull contrast for him). 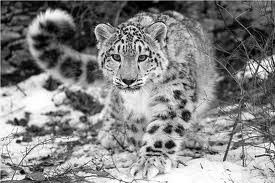 Yesterday I watched a couple of natural history docs which have given me some insight into snow leopard behaviour and their apparently solitary lifestyles, though they do maintain constant hands-off (paws-off?) contact via scenting certain points in their trail - seemingly a way to keep in touch as well as warning each other away and for most of the year they are generally a week apart from each other at all time. Joyfully, I woke up this morning with a sketch of a song in my head so I'm on track to keeping to the deadline (I think).